‘Transformational opportunities’ was the overarching theme of the opening ceremony of the Codex Alimentarius Commission today. 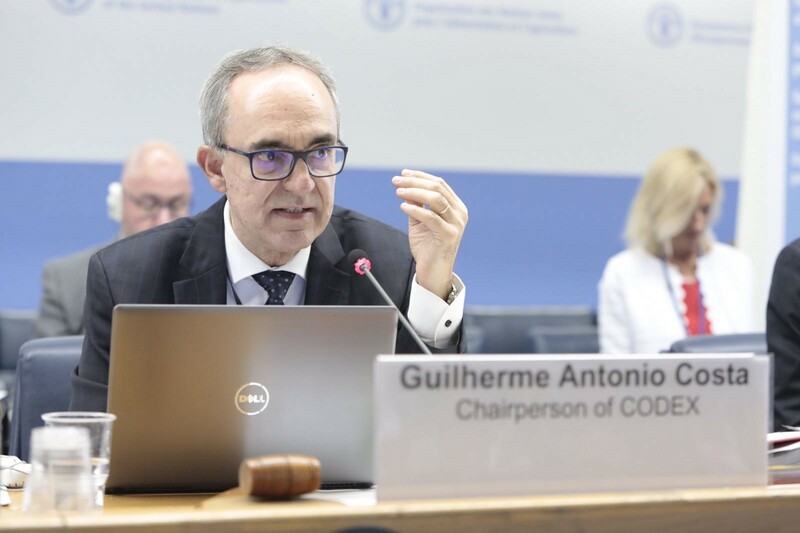 As the body responsible for all matters regarding the implementation of the Joint FAO/WHO Food Standards Programme, led by Chairperson Guilherme da Costa, geared up to adopt new standards this week, they were reminded that Codex standards are central to the global agenda for sustainable development. “One of the greatest challenges the world faces is how to ensure that a growing global population has enough safe food,” said Maria Helena Semedo, FAO Deputy Director-General, encouraging delegates to look far into the future when setting international standards that ensure safe food and fair practices in the food trade. “Food safety is a critical enabler for market access, which promotes economic development and alleviates poverty,” she said. Underscoring the multi-faceted benefits of Codex standards, WHO Deputy Director-General Soumya Swaminathan said, “Setting international standards for food safety and for nutrition, based on the recommendations informed by scientific evidence, is critical to improving the food systems and environment and promote consumption of safe and healthy diets.” She reminded Members and Observers that Codex - one of the few platforms that nurtures dialogue among governmental regulators and non-State actors, including industry and civil society - contributes to several Sustainable Development Goals. Calling for more focus on the linkages and synergies between agricultural production and trade with the sustainable use and consumption of natural resources, Olga Algayerova, UN Under-Secretary-General and Executive Secretary of the UN Economic Commission for Europe identified partnerships as an effective vehicle. “Partnerships among countries, the public and private sectors, international organizations, NGOs and donor agencies are necessary to reform our food systems, and help bring about lasting change today and for future generations,” she said. Chairperson da Costa invited the 457 delegates, representing 117 governments and 70 organizations, to focus on building consensus in setting standards. “It is essential we do our best to further develop and disseminate Codex standards in order to ensure food safety and quality for everyone everywhere,” he urged. The Commission meets for a week every year to adopt the standards, guidelines and codes of practice that are contained in the Codex Alimentarius, or food code. The texts are elaborated and proposed by technical and regional committees, who receive scientific assessments from expert bodies that are led by FAO and WHO. Prior to the current session of the Codex Alimentarius Commission, there were 221 Codex commodity standards, 106 maximum levels for contaminants in food, 4 130 maximum levels for food additives, 5 231 maximum residue limits for pesticide residues, 623 maximum residue limits for veterinary drugs in foods, 52 codes of practice and 78 guidelines.